For the first time ever, usage of Facebook went down. That’s right. The behemoth of social media saw a decline in usage, from 67 percent of Americans ages 12 and older to 62 percent of that same audience, according to Edison and Triton’s survey of 2,000 randomly selected persons. This drop is seen in every age and gender demographic as well. It’s not as if only young people, or older Americans, or women are using Facebook less. Every studied group is using Facebook less. Of course, 62 percent of Americans is still a huge group of people. 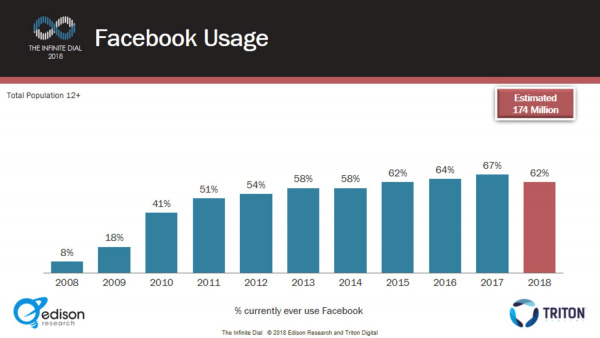 But this number puts Facebook’s 2018 usage in line with the 2015 penetration rate. Facebook just gave back two full years of user growth. And a drop from 67 percent to 62 percent is a decline of eight percent overall in one year. Again, not enormous when looked at in isolation, but given Facebook’s steady, upward trajectory since the first Infinite Dial study in 2008, it’s quite a difference in pattern. 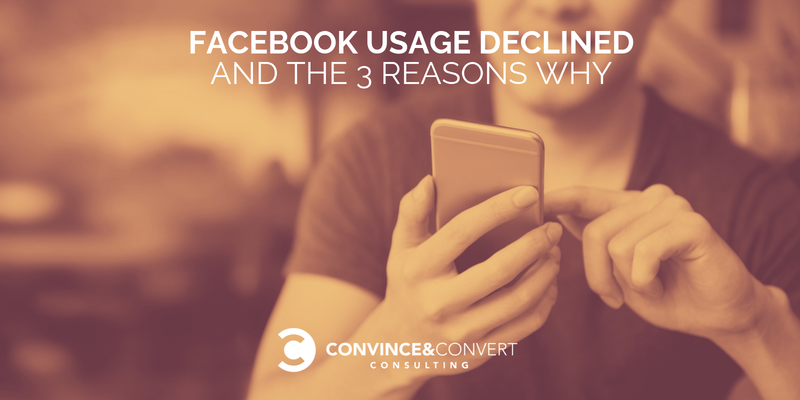 Why, after a decade, did Facebook finally see a reduction in usage in the United States? I believe there are three explanations. It hasn’t been a great year for Facebook as an organization. The mainstream media has consistently covered Facebook’s role (or at least complicity) in the world of “fake news.” When you combine this with the company’s other missteps in the areas of privacy and accountability, you end up with an environment where the users of the platform may not fully trust the motives and judgment of those that operate the platform. Given that Facebook has access to many of our most important personal data points, photos, and feelings, a drop in trust could create a drop in usage. If you’re a Facebook user, I’m sure you’ve seen this in your own News Feed: someone who says they are logging off of Facebook for good because of the rampant negativity present on the platform. In the shadow of the presidential election, there has been a continued polarization of thought in America, and an acceptance that the new normal is a climate of “us” vs. “them.” This is tiring. Each time you express an opinion on Facebook, you must defend that opinion from segments of your “friends” who are now “the opposition.” This squeezes the fun out of Facebook, like Fergie squeezing propriety out of the national anthem. When additional Infinite Dial data is released, we’ll have more insight on this point. But I predict we’ll see an even greater drop in daily usage. While there are some people who have signed off of the platform entirely due to discord, anecdotally, I believe the bigger change is people using Facebook a couple times a week instead of every day. Indeed, I believe reduced trust in our Facebook overlords along with reduced willingness to argue amongst ourselves on Facebook contribute to this first-ever reduction in usage in America. Coca-Cola is doing the same thing. They just rolled out four new flavors of Diet Coke, enveloped in a chic, skinny can. These new adjuncts will assuredly reduce consumption of old-school Diet Coke, but they hope that this move will grow their overall market share, across all five beverage flavors. Last year, I wrote about Facebook mimicking all of Snapchat’s features and baking them into Instagram. At that time, I predicted that while Snapchat’s user base would shrink as a result, it would actually be better for them strategically. Casual users of Snapchat (like me) would leave the platform and use Instagram instead (like me). Thus, the remaining Snapchat user base would become more homogenous, allowing them to charge a greater premium for advertising. And Snapchat just announced their first-ever profitable quarter, so that may be precisely what occurred. Distrust. Discord. Disinterest. These are the 3 reasons for Facebook’s decline in usage. Facebook’s vision—as articulated by Mark Zuckerberg many times, and in many ways—is to be the way humanity connects. And they are when you look at the entirety of their holdings. But, when you look at the do-everything workhorse that is Facebook per se, the bloom is finally off the rose. Too big, too boring, too noisy, too everything. Should Facebook be concerned about this drop in usage? Yes. But as long as they are growing their user base across everything they own, they’ll continue to dominate social media, and beyond.